I never had any affinity with 12 inch disco singles. They occupy too much space, the sleeves are ugly, and most of what I have heard of those extended versions is less interesting than the original versions. Of course their will be exceptions; I gladly get those on a CD. Now I have a few hundred 12 inch records in my room, which formed the heart of Alex’s record collection. I have sorted them out, as far as I can without listening to them. The means I have made three piles: one with the early disco records (from the late 70’s and early 80’s), one with garage, house, hiphop and other dance records from the late 80’s and early 90’s, and a pile with left overs. I have no idea what to do with all these records. I am making Cd-compilations of some of the songs I like, but I don’t want to add all these records to my collection. I only want to keep what I really love, and that will be less than 50 records. That leaves another few hundred records to get rid off. I would love to sell them for a lot of money, but I have never been able to make much money on records, so I have my doubts if that will work. I checked on e-Bay what I can expect for this kind of records, but that was difficult. The records that are sold for interesting prices have to be exactly that copy in mint condition, and it will be a lot of work to sort out the records that are worth selling on e-Bay. Most of them are not collectable anyway, I guess. If anybody has any advice on how to make money out of these records, please let me know. And if you have search lists, please send them too. I have played some of the records at random, and recorded the best things I found so far on CD’s. I like the raw, noisy up tempo songs. Alex also had a lot of mellow stuff. Sometimes I recognise a record, but much is new to me. I never had much interest in garage and house, and most of the records that I needle skipped in the past two days confirm my ideas about this kind of music: it is not my cup of tea. But there are more than a few exceptions. I have already heard enough songs that made me understand why some people get excited over this genre. The experimental, noisy, almost punk like songs are indeed interesting. 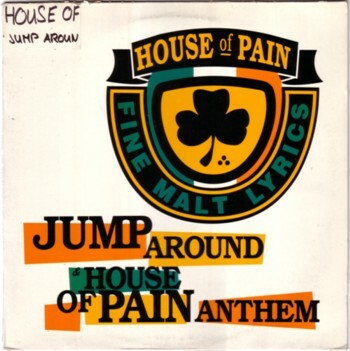 Here is one of my favourites, which I think was a hit, by The House of Pain: Jump around . I don’t know if you still have a pile of records to get rid of, but I find discogs.com a good site for selling vinyl. You can easily see what other sellers are asking for a record, and listing records for sale (after creating an account) is free, unlike eBay. You only pay commission after a record id sold. Thanks for the comment and info. Selling things is not my thing. All my attempts are halfhearted at best. I prefer exchanging stuff with like minded people.